Boy is it hot outside. We are into our hot and dry season now and it is full on. The temperature got to 34 today and I decided to stay and work in the office in the nice air conditioning. I did get in a little trouble though as I let all the neighborhood dogs in also to enjoy the A/C, and we didn’t have any room for customers for an hour or so until Claudio made me throw all the freeloaders out. After that we had a busy day. I guess with all the hot weather everyone wants to cool off on the Discover Divers boat and go diving. we have a full boat tomorrow and Thursday is looking almost full already. On top of that, Sail Rock is starting to clear up and now we can go back and looking for my friend the whale shark again. 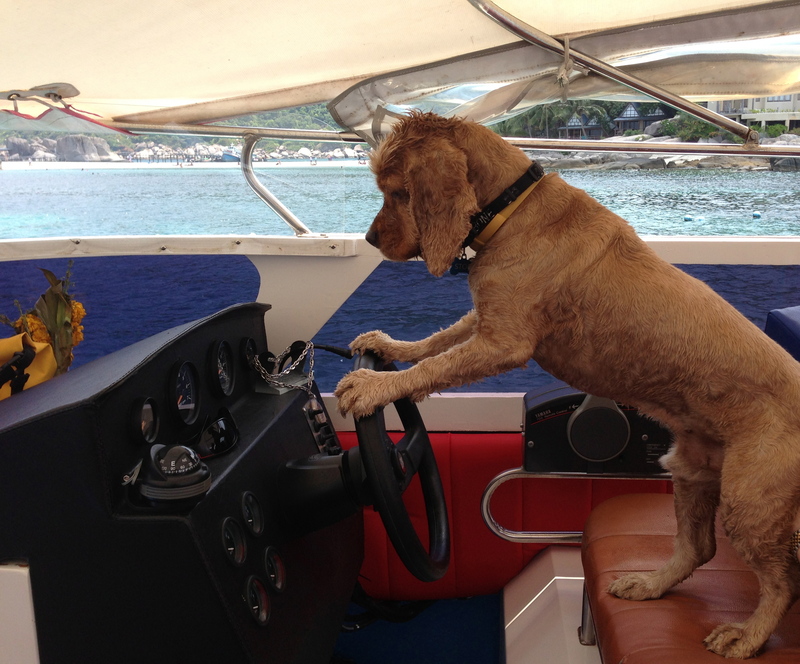 I’m just waiting until I get a canine course to start and then I’ll be back on the boat. As far as the weather goes, it looks like more of the same for the foreseeable future. Hot and dry with very low wind and waves and no rain in the forecast. I guess I’ll have to water the plants the old-fashioned way by lifting my leg. Whatever works. I’ll leave you with a picture of me working away today helping customers. What a day! I started my new job today as boat captain. 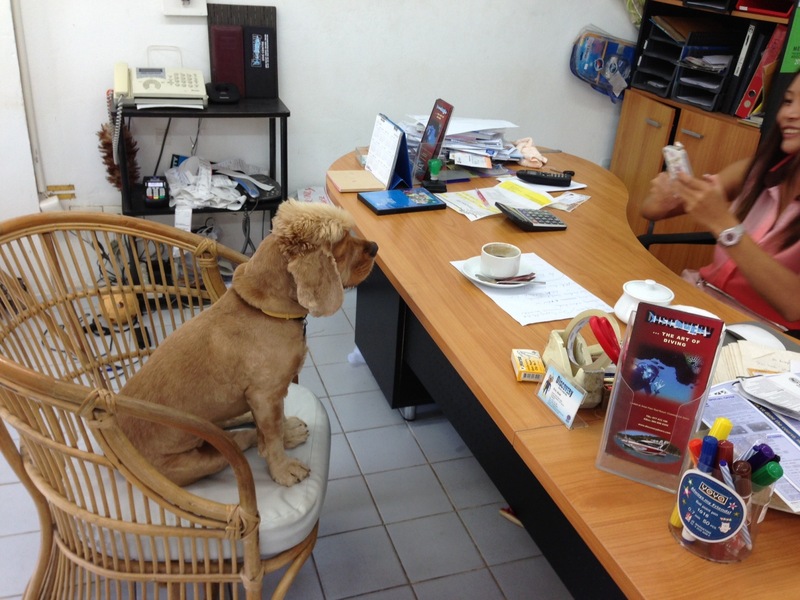 Of course I will work that along with my other jobs as canine scuba instructor, snorkel guide, and office manager. I’m like a Jamaican with 4 jobs. So today I drove the boat from Samui to Koh Tao with a full boat of divers under the watchful eye of course of Captain Aon. I really didn’t need his help though as I already know how to use the compass from my dogmaster course and all the customers were happy to see me driving. On top of that, it was such a beautiful day. the seas were flat, the sun was out all day and the diving was great. We had all sorts of customers today while Arnould had discover scuba divers, Claudio had a scuba review, Tao had the open water fun divers and Nick had the advanced fun divers. The weather looks awesome all week as now we are into our hot and dry season and I had to do some backflips off the boat today just to stay cool. Check out some more of the cool pictures from the day and other days on our facebook page. You can reach it from the website link to the right.